TakeToux is a realistic and immersive training experience for cyclists. 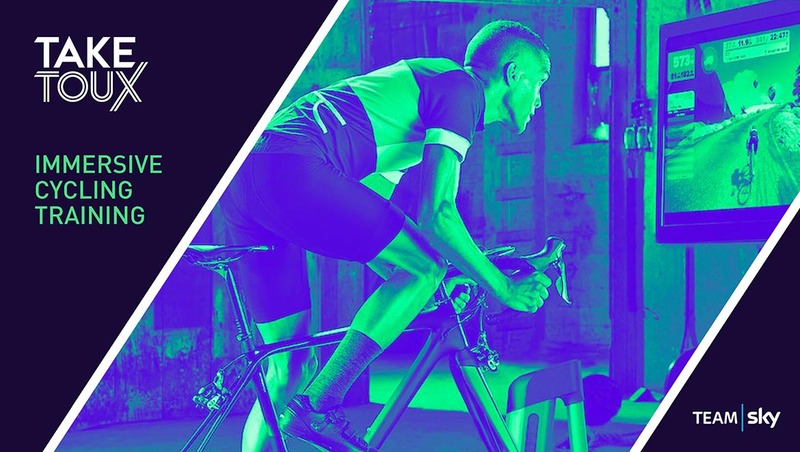 It creates physical route simulations for smart turbo trainers, visual route simulations for screens and headsets, and delivers live audio commentary from a personal team director! Any route, anywhere, any time. A route may be unfamiliar to you - but hundreds of other riders have already ridden those roads. Their ride data is held by the popular GPS trackers like Strava, Ride With GPS and Garmin Connect. This means that these guys know the precise direction and gradient of every metre on every road that's ever likely to feature in a pro race. TakeToux uses amalgamated data to create a physical simulation of any route you care to map. 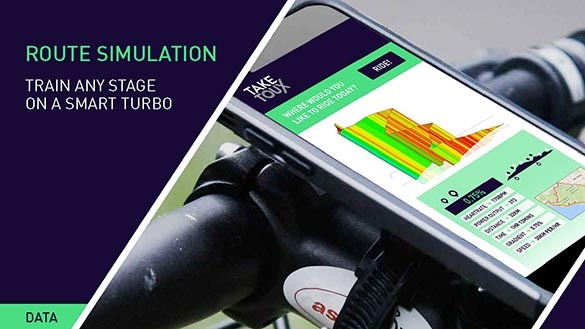 This simulation then powers a smart turbo trainer. When the road kicks up, the resistance increases - precisely matching ride conditions. Strava's massive dataset also allows us to analyse past riders' metrics on each section of the route - power, heart rate, speed. So by comparing like for like, we can create personalised target metrics for any rider's training. 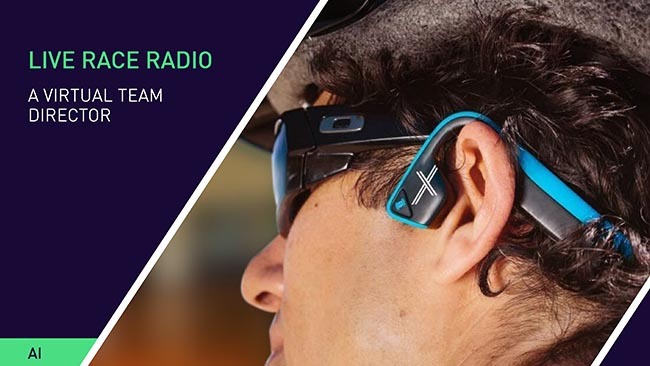 TakeToux uses artificial intelligence to deliver personalised audio commentary synched to your training. We do this by monitoring your real-time performance on any virtual route and comparing it with your target metrics. This data is then converted to smart information, instructions and motivation - and delivered as a voice in your headphones. It's just like having a race director in your ear! 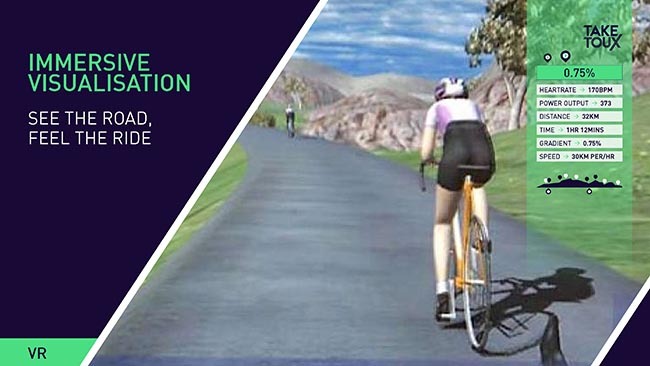 Sure, you can watch endless episodes of Game of Thrones while riding your turbo - but how much better to immerse yourself in a virtual environment? To be ‘on the road’ in perfect sync with your training simulation? TakeToux uses the same data that powers the physical simulation to create a visual representation of the ride. It's a bit like Zwift but better because TakeToux builds real stages with real data. Choose between 2D output for a screen - TV, iPad, phone - or 3D for virtual reality headsets. TakeToux is a training system for pro teams. However, it can also be marketed commercially to consumers. All they need is a smart turbo trainer. 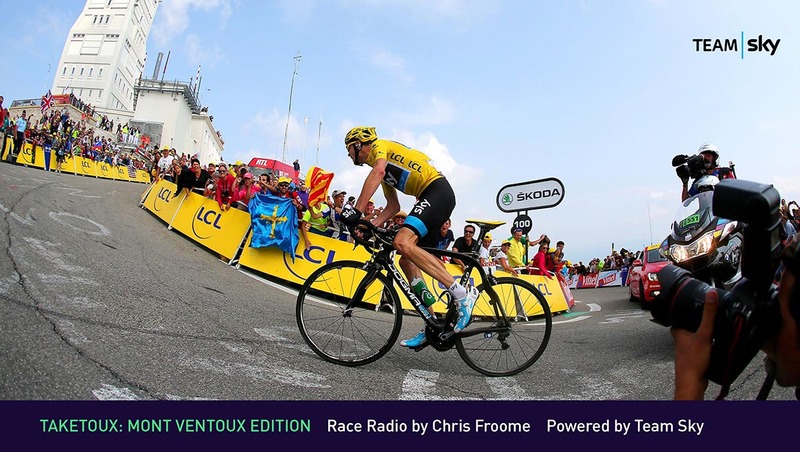 Additionally, TakeToux race radio can be packaged as a standalone mobile app that generates audio commentary during actual rides, perfecly synched via live GPS. This is especially well suited to bucket list riders tackling iconic climbs. Climbing the high mountains is tough, painful and lonely. TakeToux takes you to the top. 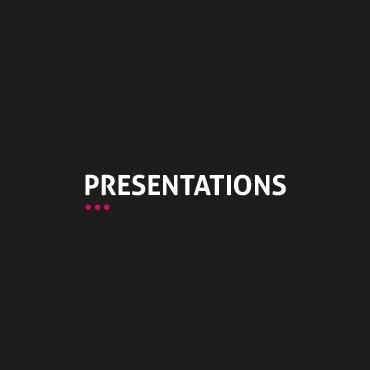 We are Mantra - a creative agency headquartered in Glasgow. We really get immersive technology - see our virtual reality video below. * We haven't built TakeToux yet, but we'd love to do that with you, Team Sky. And we'll work for Pinarellos. Probably.